I had the deep pleasure of reading and reviewing a book by Michele Phoenix, an alumni and former staff at Black Forest Academy. Wow, that sentence seems so small compared to the magnitude of her time, energy, and entire person involvement with the community at Black Forest Academy, and Third Culture Kids worldwide. I met Michele during a one week training with TeachBeyond at Wheaton College in 2010. I listened to her speak, looked over the books sitting on her table, and was moved by her heart for missionary children and their families. We’ve stayed in touch on Facebook since that time… and unfortunately, her departure from BFA (after 19 years!) happened to coincide with our arrival… so we still don’t get to live in the same place. How my writer’s heart longs for a local community of writers! But alas, God has plans for her that are equally wonderful and life-changing… and need to occur stateside. She has three: Tangled Ashes, Edge of Tidal Pools, and Shards of Shell. She had been self-publishing her work… and after some divinely appointed circumstances, Tyndale House picked up two of her books! Considering the very few books they publish each year, this was incredible! From my side of the screen, I did a little dance and cheer for Michele. And now I have the privilege of reading them! Edge of Title Pools was loaned to me by a dear friend as I prepared to enter the world at BFA of missionary children and third culture kids. I read it on our final road trip of fundraising this last July. It is very well written and felt clearly to me, a way that Michele was processing some of the harder aspects of her own life and ministry. And, as she writes, from the experiences of her friend who actually lives on the island and shares many experiences with the main character of the story. I recently read Tangled Ashes. Having only read Edge of Tidal Pools, I sort of expected the same kind of dark themes and heavy writing. However, I was pleasantly surprised to find a whole new kind of writing from Michele. This book is quite different from Edge of the Tidal Pools. I won’t give you much of the content of the book (you’ll have to read it yourself) however it is a historical fiction set in World War II France. She beautifully weaves together the stories of multiple characters and time periods, bringing true-to-life places from her childhood into the role of core setting for her story. One of my favorite things was going to her website after reading the book and viewing the photo album of the places she had written about. I loved that! Of course, reading this book while living in Germany only made it that much more exciting… to know that the contents of her story happened to close to the very places I curl up, entering into a world that was not too long ago and held major ramifications for the world and this part of it specifically. The reading was not as heavy or dark as the former book I’d read, but still so powerful in communicating the messages of pain and redemption for believers and unbelievers alike. I also appreciate that the story doesn’t end with a neatly tied bow on every person’s struggle… because that is not how life works. Yet she leaves enough hope that your soul isn’t dragging on the floorboards in grief either. 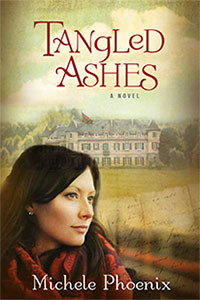 Tangled Ashes is a great story and I truly recommend that everyone read it. Especially if you like historical settings and events, cross-cultural stories, and wonderful story-telling. It should be noted that I don’t do many book reviews from this site… so count it high that I’ve taken time to do one today! That’s how much I think of Michele and her books. On that note… I’ll let you go get your book and start reading.